Our California (previously California, Here We Come!) 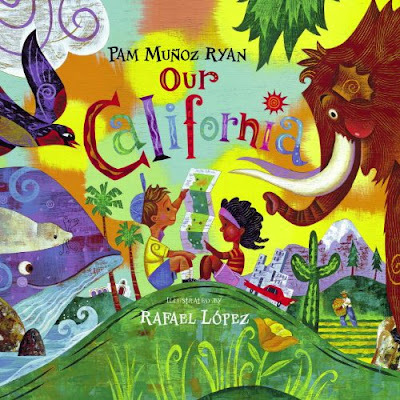 has been re-illustrated and re-designed, with short poems that celebrate 14 of California’s major cities and regions, and back matter that includes state symbols and additional artwork and information about each place. López’s double-page spreads are stunning. Rendered in bright, bold acrylics on a palette of mostly reds, greens, blues and purples, the paintings are heavily saturated and textured by scratching and scraping the paint on grained wood. Some bring to mind the Mexican muralistas and WPA artists, others have a graphic-novel feel, and still others have a sort of folkloric tone. There is also a good deal of magical realism here. For instance, the spread for “Los Angeles” shows a movie director riding a terrified mastodon, who is stuck in the tautologically named “La Brea Tar Pits” near Hollywood. about a quaint village where swallows return. to build a grand mission from adobe clay. Junipero Serra did not build anything. Rather, it was his padres and soldiers who wreaked havoc—physical and spiritual—on the enslaved Indian people who built the 21 missions that line El Camino Real. Another example: In the section describing the Central Valley, López’s spread at least shows a few agricultural workers, but Ryan’s text disappears them. feeds the whole nation with its orchards and fields. This rich, thirsty farmland needs water to thrive. Canals, pumps, and dams keep this valley alive. Thousands of years ago Asian hunters migrated to North America through what is now Alaska. Their descendants, the first Californians, later became known as Native Americans. I could easily deconstruct each textual section, but I won’t bother. Despite López’s excellent artwork, Our California is not recommended.